Like many schools, we got 2 3d Printers this school year. So, after a couple weeks of testing them, we turned the students loose on them. I worked with our 7th grade Science teacher to develop the first project we wanted to do. We decided to have the student design their own 3d models and go through the problem-solving process for printing these models. But first we had to have them understand how the 3d printer worked and what was possible, probable, and unlikely. The first part of the project, we had them go to thingiverse.com and work in groups to find templates that tested different types of printing. One group was tasked with finding hollow spheres while another had to find a solid cube and so forth. Each group chose a template model and then sent it to me to be printed. After these were printed, the class analyzed their printed products and we had a discussion on what worked and what didn’t work. We also talked about why some shapes worked better than others. Thinking in 3d is a skill not many kids have had to do. They discovered concepts like printing top heavy items need filler for stability, or that printing items that are “suspended” in space needed supports to be printed. Once the students typed their reflection and turned it in, they were ready to move to the design process. The students were tasked with identifying a need in their life and designing a product that fills that need. We held a group brainstorm session and work students through the process of finding a problem and then concepting ideas to solve the problem. Once students had time to do this on their own, they had to submit a paragraph write up of their idea and the need it would meet. 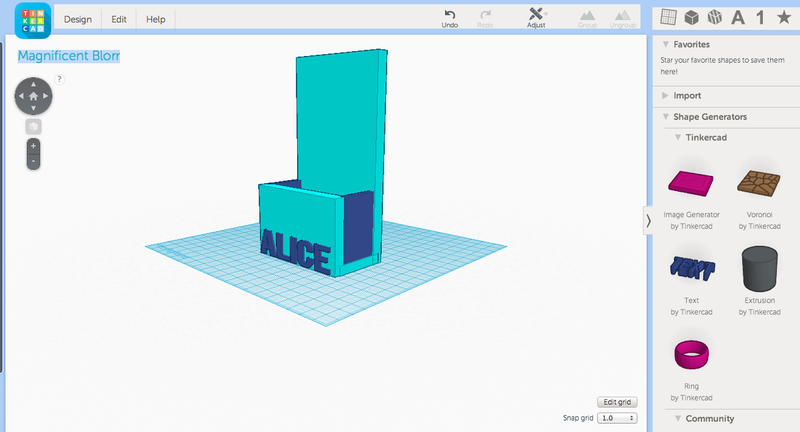 We introduced Tinkercad to the students and let them run wild with it. Many were surprised at first that they were designing from scratch. No templates could be used at this point. 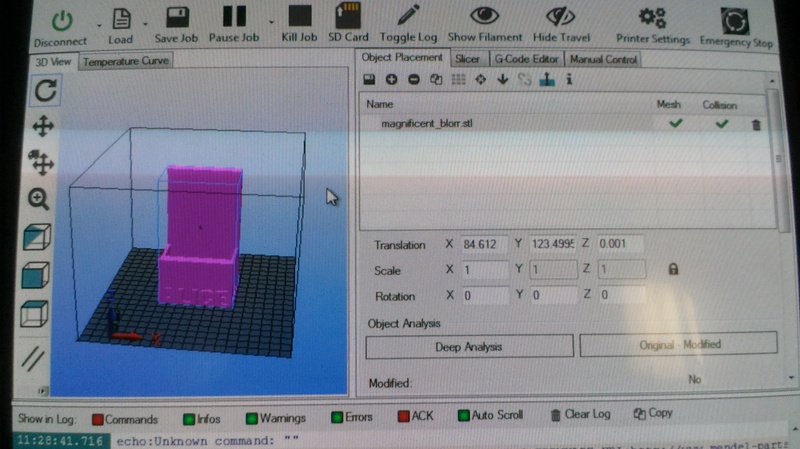 Once the students got familiar with the tools, they began building their models to be printed. The students needed to make sure the measurements were correct. The default setting is in millimeters so students quickly realized if they designed it just by eyeballing it on screen, it would turn out much smaller than they expected. All part of problem solving! Once they thought they were ready to print, the science teacher or I would discuss with them potential pitfalls they might consider. Considering the amount of time it takes to print, we only gave them one chance to print their final product. We made sure they understood, they weren’t graded on the final product they printed, but rather the process they went though to get there. We’re in the final stages of the process, so I’ll be seeing more of their products soon. 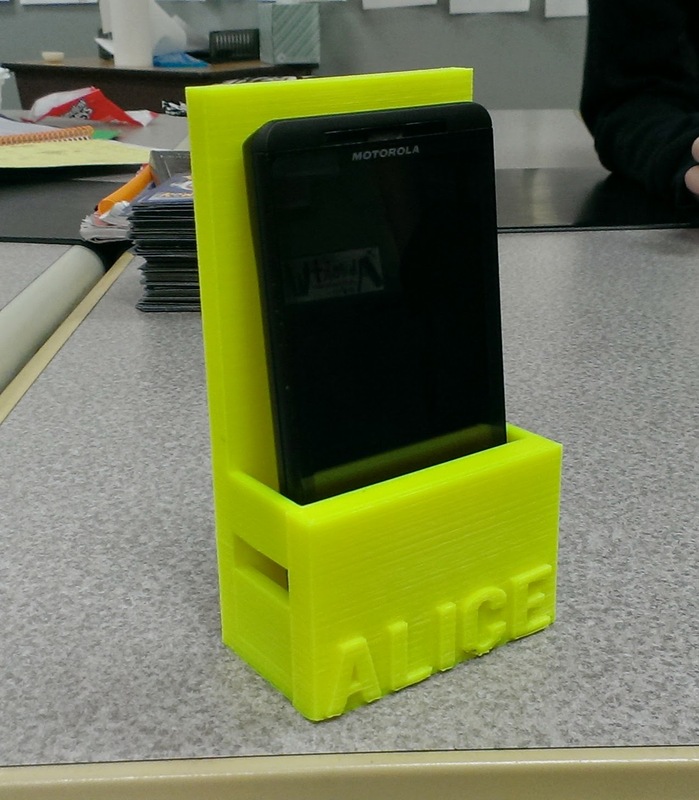 I’ve printed a phone charging stand (pictured below). Students are creating hair tie holders, pencil holders, a spork for camping, a multi-page bookmark, and more. I plan to post more pictures as they become available. Once this project is finished, I need to come up with some scaled down projects for the younger grades, but we’d like them to practice similar skills. I’d be interested to hear your thoughts on the project or answer your questions about 3d printing in comments below.